Two series of LUMATEC LIQUID LIGHTGUIDES are offered. The new Series 250 transmits radiation down to a wavelength of 250nm, and with short lengths even down to 220nm. As a result, applications requiring UVC now also benefit from the advantages of LUMATEC LIQUID LIGHTGUIDES. Important applications are wafer manufacturing, analytical measurements, fluorescence, epoxy curing where UVC eliminates the surface smear film, and photo therapy. Additionally, critical applications with high power UV lasers (i.e. 308nm excimer laser) are now possible with excellent transmission stability. 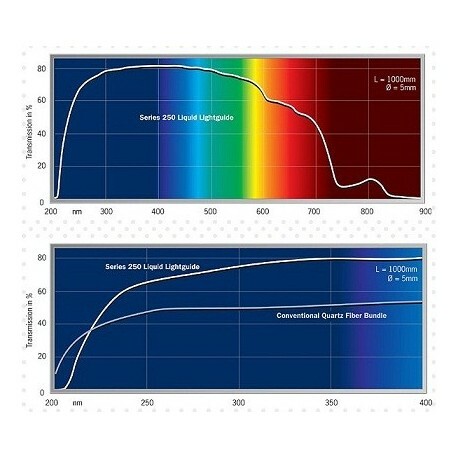 - In the wavelength range between 230 - 400nm the transmission of LUMATEC LIQUID LIGHTGUIDES Series 250 is significantly higher. - The theoretical maximum angle of aperture 2a is 50 for Series 250 and only 29 for quartz/quartz fiber bundles. 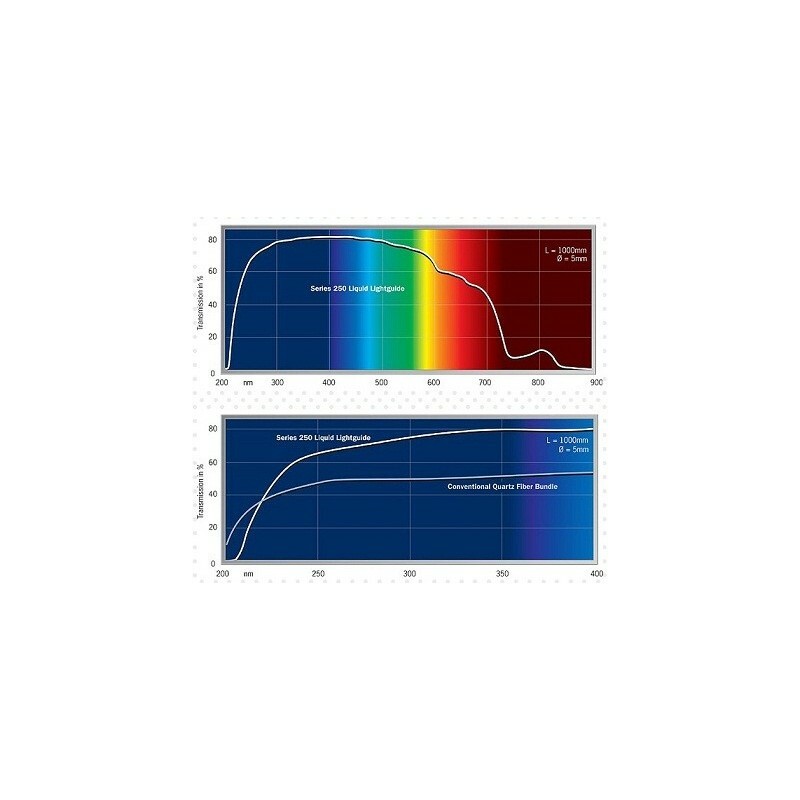 Thus LUMATEC LIQUID LIGHTGUIDES Series 250 can transmit more power from conventional, non coherent UV sources. - The costs for LUMATEC LIQUID LIGHTGUIDES Series 250 are only a fraction of those for quartz fiber bundles. We also offer the standard Series 300 for UV curing aplications in the range of 300nm - 650nm as a more economical option for more general UV curing. Two series of LUMATEC LIQUID LIGHTGUIDES are offered. The new Series 250 transmits radiation down to a wavelength of 250nm, and with short lengths even down to 220nm.